Super Picosecond laser uses short pulse (one trillionth of a second in length) to crush the melanophore in epidermal layer with the efficient shockwave offered by high energy. Melanin is pulverized into tiny dusty particles, the particles are so small that they are more readily absorbed and eliminated by the body. Picosecond laser can also penetrate into deep dermal layer to stimulate collagen renewal and regeneration. Clinics have received good results for the treatment of pigmented lesions, wrinkles, acne scars and shrink pores. 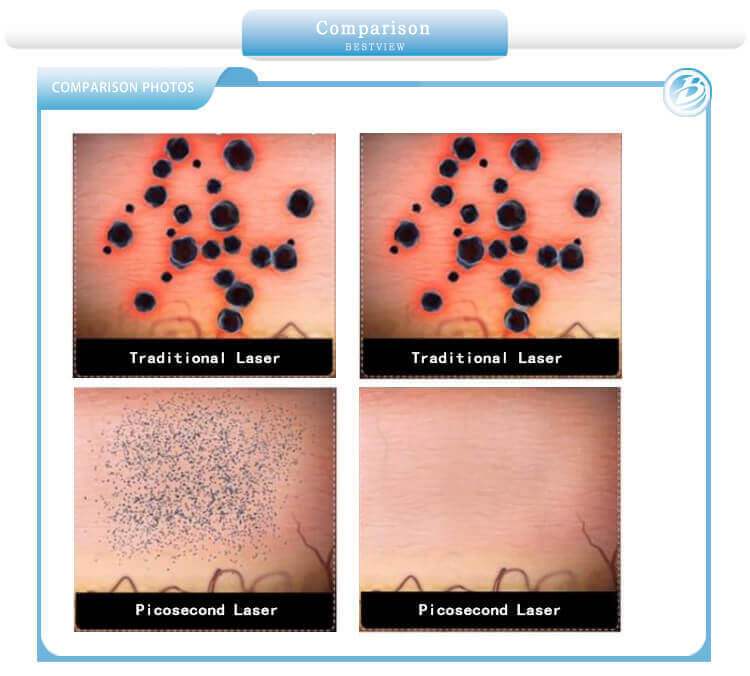 Please check super picosecond laser treatment before and after photos. Picosecond laser offers a gentler, fast, efficient and easy, non-surgical, non-invasive laser skin treatment for patients seeking better appearance on their face, hands, chest, decollete, legs and more. 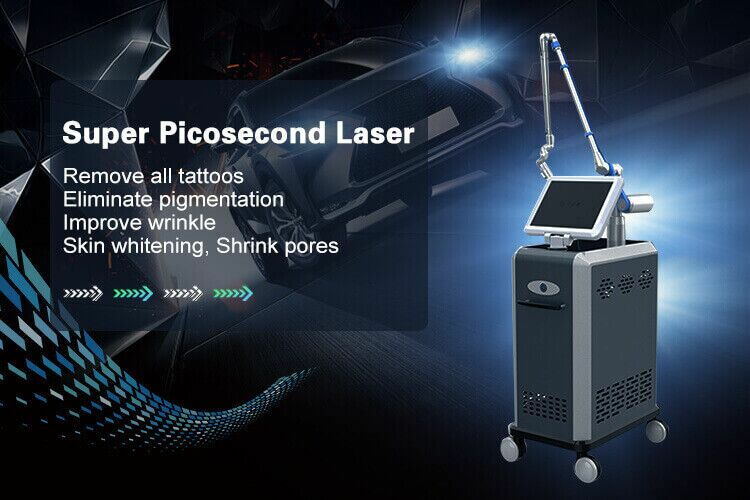 With higher peak power, the pulse width of picosecond laser machine is a hundredth of traditional laser, so almost all the energy is absorbed by targeted tissues. Picosecond laser reduces tattoo and pigment removal from 5-6 times to 1-3 times, dramatically reducing treatment and recovery time with fast and significant effectiveness. 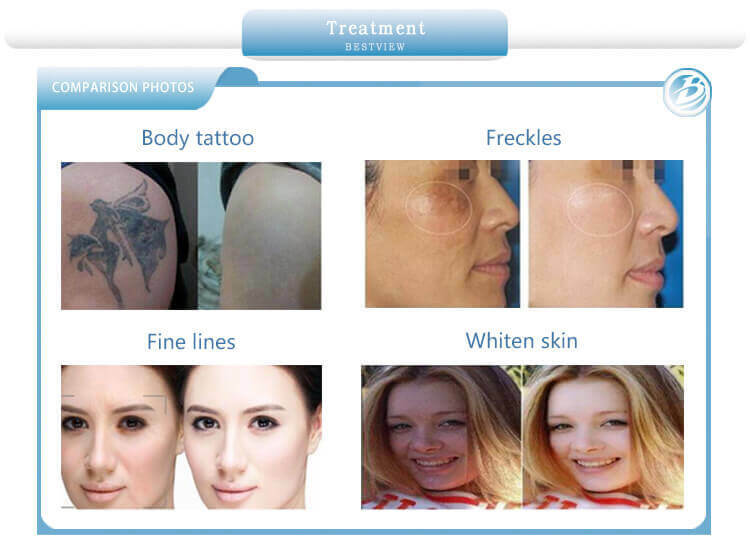 With precise positioning of the target tissue, Picosecond laser can remove all kinds of pigment and tattoo in less short pulse, reducing damage to the skin. For recovery time, Picosecond laser machines need 3~6 hours after treatment, but traditional lasers need 2~3 days after treatment. 2. Precise. 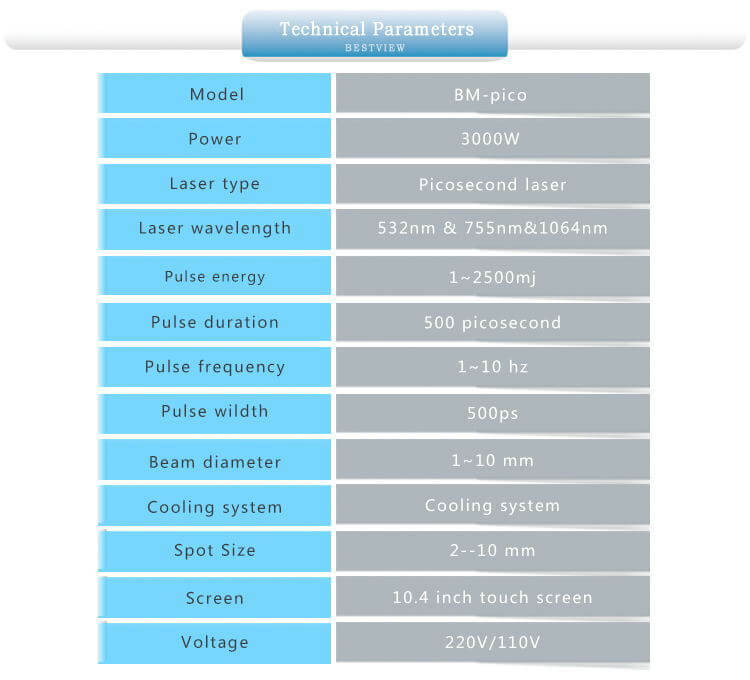 The pulse width of picosecond is only a hundredth of traditional laser, so almost all the energy is absorbed by targeted tissues instead of producing photothermal effect. 3. Harmless. (1 picosecond = 1 trillionth of a second) such short time won’t do any harm to skin. 4. Focus. Since laser energy is gathered and focused on targeted area, 20 times of effect can be realized without doubt.